I'm wrapping up a second week of Take One, Pass it On today! If you haven't been following along, basically...I re-wear something every day from the day before. Today's remix was a bit of an accident - I threw coat on the bed where this sweater was laying and thought, "Hey! 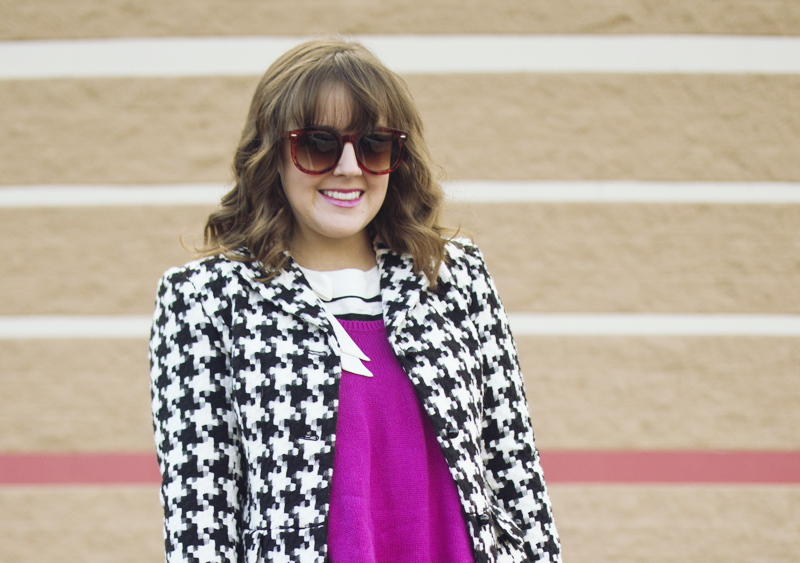 I like that color with houndstooth." This sweater, of course, is it's own breed of Well isn't that...special. On the Victoria's Secret model, it looks swingy and effortless. On me, it kind of looks like I shrunk a sweater dress and just kept trying to wear it anyway. I love the color, but it's not my most FLATTERING pick. Regardless, It's comfy and I figure I still look better than the girl that left her house in sweatpants today. Actually, I shouldn't make fun of that girl. We got a new bed delivered yesterday and I've spent most of the day in my sweatpants in that new bed because it's amazing. Here's how I wore the coat yesterday! Link up below if you remixed today and make sure you visit Sarah's Real Life if you've been participating in Take One, Pass it On!